‘On Friday 2nd June 2017, the Nigerian news circuit was set ablaze with surprising news that Dammy Krane had been arrested in the US for Grand Theft, Credit Card & Identity Fraud. 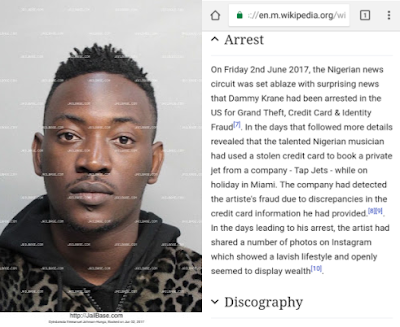 In the days that followed more details revealed that the talented Nigerian musician had used a stolen credit card to book a private jet from a company – Tap Jets – while on holiday in Miami. The company had detected the artiste’s fraud due to discrepancies in the credit card information he had provided.. In the days leading to his arrest, the artist had shared a number of photos on Instagram which showed a lavish lifestyle and openly seemed to display wealth’.